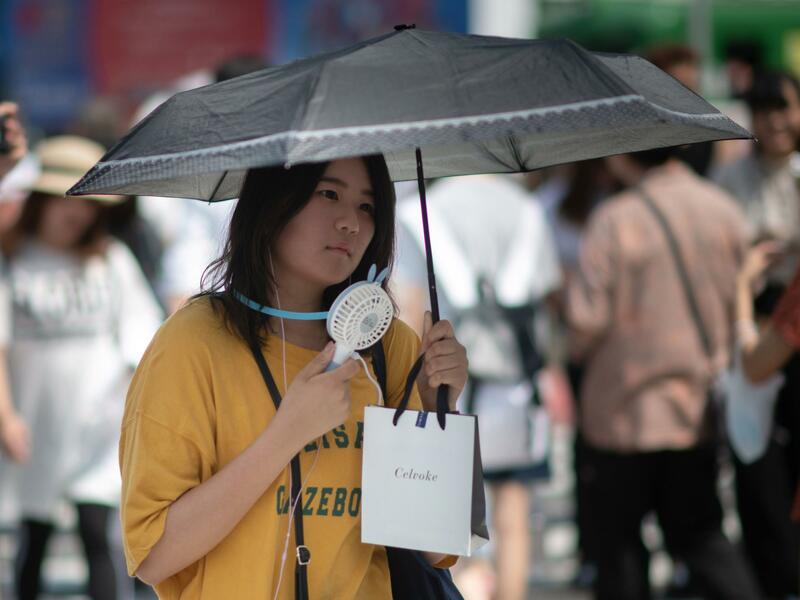 A woman uses a portable fan to cool herself in Tokyo on Tuesday as Japan suffers from a heat wave. Scientists say extreme weather events will likely happen more often as the planet gets warmer. When the news is full of stories on extreme weather, it's hard not to wonder: Is this what climate change looks like? "We see five times more large fires today than we did in the 1970s," says Jennifer Balch, professor in geography and director of Earth Lab at the University of Colorado Boulder. Wildfires are part of the ecosystem of the American West, and scientists expect a certain number of them under normal average conditions. But what global warming does, says Balch, is change the backdrop against which they happen. "Fire season is about three months longer than it was just a few decades ago," she says. "We've seen a 2-degree Fahrenheit increase across the Western U.S. Snowpack is melting earlier, and what that's doing is essentially opening up the window for fires to happen over a much longer period of time." Last year was the costliest fire season ever, with damages exceeding $18 billion dollars. Overall, weather and climate disasters in the U.S. caused more than $300 billion in damages in 2017, shattering previous records. Though that's not all climate — those increased costs are partly the result of development and sprawl. Andreas Prein is a research scientist at the National Center for Atmospheric Research in Boulder, Colorado. He studies how extreme weather — especially thunderstorms and heavy downpours — might change in the future. "What we see from climate change is that you lose a lot of these very moderate and light rainfall storms and replace it with very intense storms," he says. Over the last 50 years, the number of really big rainstorms has increased by as much as 70 percent. Scientists are just beginning to put numbers on the effect climate change is having on individual storms. "They pick an extreme event — let's say, Hurricane Harvey from last year — and they try to run the event without human greenhouse gas emissions," Prein says. "And then they add the human component ... to the atmosphere and basically compare those two realizations of the world with each other. So you can try to get a feeling for how we altered specific extreme events or the likelihood and intensity of an extreme event." Some aspects of climate change are pretty certain, he says. Temperatures are rising. Rainstorms and heat waves are getting more intense. These are the long-predicted results of increased greenhouse gas emissions. To a certain degree, that we've had so much extreme weather this past week is a coincidence: fires, heat waves, and rainstorms happen every summer. But climate change makes this kind of extreme weather more common, researchers say – and it's a trend that's expected to continue as the planet keeps getting warmer. This past week has brought dramatic weather events around the world. Deadly heat has been baking Japan and Britain. Wildfires in Greece, Scandinavia and the western United States also costing lives. And then record rainfall in the northeastern U.S. NPR's Laurel Wamsley takes a look at how this extreme weather fits into the big climate picture. LAUREL WAMSLEY, BYLINE: 2018 is looking like it could end up being one of the hottest years on record. And when the news is full of stories on extreme weather, it's hard not to wonder, is this what climate change looks like? Climate scientists say, yeah, at least partly. Take wildfires, for example. JENNIFER BALCH: We see five times more large fires today than we did in the 1970s. WAMSLEY: That's Jennifer Balch, professor in geography and director of Earth Lab at the University of Colorado Boulder. Wildfires are a normal part of the ecosystem of the American West. What's changing is the backdrop against which they occur. BALCH: We've seen a 2-degree-Fahrenheit increase across the western U.S. Snowpack is melting earlier. And what that's doing is essentially opening up the window for a fire to happen over a much longer period of time. WAMSLEY: In fact, fire season is three months longer than it was just a few decades ago. Last year was the costliest fire season ever, with damages exceeding $18 billion. Weather and climate disasters in the U.S. caused more than $300 billion in damages in 2017, shattering previous records, though that's not all climate. The increased costs are partly caused by development and sprawl. Andreas Prein is a scientist at the National Center for Atmospheric Research in Boulder, Colo. He studies how extreme weather, especially thunderstorms and heavy downpours, might change in the future. He says that over the last 50 years, the number of really big rainstorms has increased by 70 percent. ANDREAS PREIN: What we see from climate change is that you lose a lot of these very moderate and light rainfall storms and replace it with very intense storms. WAMSLEY: Prein says scientists are just beginning to put numbers on the effect that climate change is having on individual storms. PREIN: They pick an extreme event - let's say Hurricane Harvey - and they try to run the event without human greenhouse gas emissions. And then they add the human components to the atmosphere and basically compare those to realizations of the world with each other. So you can try to get a feeling for how we altered a specific extreme event or the likelihood and intensity of an extreme event. WAMSLEY: Some aspects of climate change are pretty certain, he says. The planet is getting warmer. Rainstorms are getting more severe, and so are heat waves. PREIN: You can clearly attribute this to climate change. WAMSLEY: To a certain degree, that we've had so much extreme weather this week is a coincidence. Fires, heat waves and rainstorms happen every summer. But what researchers do say is that climate change makes this kind of extreme weather more common. And that trend is expected to continue as the planet keeps warming. Laurel Wamsley, NPR News. Transcript provided by NPR, Copyright NPR.